Awaken the art of handwritten communication with iota's line of stationery brought to you by C.R. Gibson. This deluxe folded note card set contains 12 cards with a tipped-on thank you message, and colorfully juicy curved-flap envelopes. Packaged in a Kraft box with delicately carved front window and disc and string closure. 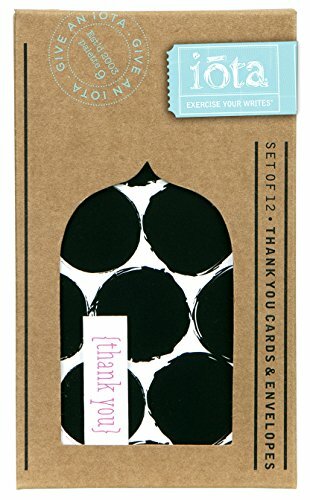 Includes tip sheet on how to write a thank you note. Cards measure 3.25 x 5.75-inches. Welcome to the colorful, carefree spirit of iota, where the belief is that color is a choice - an attitude, a personal adventure into self expression. A lively mix of paper and textile-driven products in a variety of unique categories: baby and women's accessories, social stationery, eco-fashionable totes, kitchen collections, tabletop, and gift items. Whether buying iota for oneself or giving it as a gift, both are joyful acts of defiance against the humdrum, the ordinary, the colorless. C.R. Gibson is pleased to bring you the colorful spark of iota, where it's always about the little things, where every iota makes a difference. When you want the best in party and giftware, trust C.R. Gibson, synonymous with quality for more than 140 years. Starting with the creation of the very first baby book in 1898, families around the world have depended on C.R. Gibson as their number one provider of products that celebrate life's most cherished moments. Today you'll not only find baby books and photo albums, you'll also find a wide choice of party supplies, gift ideas, and little luxuries to make your life easier. Understanding the importance of design and craftsmanship, all C.R. Gibson products offer a tradition of quality that highlights classic styling as well as today's top fashions. View More In Tent Cards. If you have any questions about this product by C.R. Gibson, contact us by completing and submitting the form below. If you are looking for a specif part number, please include it with your message. C-Line® - Printer-Ready Name Tent Cards, 4-1/4 x 11, White Cardstock, 50 Letter Sheets/Box - Sold As 1 Box - Create name tents and signs using your laser or inkjet printer.